Sitting Position – Sit in a comfortable chair without armrests; back straight, and feet flat on the floor. Keep your hands either cupped one inside the other just below the navel, or simply rest them on your thighs. The main purpose of our sitting position is to be comfortable and alert. Do not lie down, as you’ll probably fall asleep. Concentration – Use the counting technique to help you develop your concentration. During your meditation, count your breaths 1 through 5 silently in your mind. When you get to 5, simply start over again. Keep your attention focused on the air passing through the tip of your nose. When you find that your mind has wandered, bring your attention back to your breath immediately. Concentration meditation will help you develop mental discipline. Mindfulness – After a few minutes of concentration meditation, switch to mindfulness meditation. Continue observing your breath. However, this time instead of counting each one, simply observe the entire breathing process mindfully. This means that you are relaxed, and not forcing yourself to do anything. When distracting thoughts arise, gently bring your attention back to the breath. If you want to make steady progress in your spiritual growth, we suggest meditating regularly, preferably daily. How long you meditate depends on your available time. But remember, how fast you progress in your spiritual development will always depend on the time and effort you dedicate to your meditation practice. We suggest you begin meditating for about 10-15 minutes daily, using the format outlined above. If you can meditate for longer, feel free to do so. Remember, it’s important to follow the proper techniques in order to get the most from your practice. 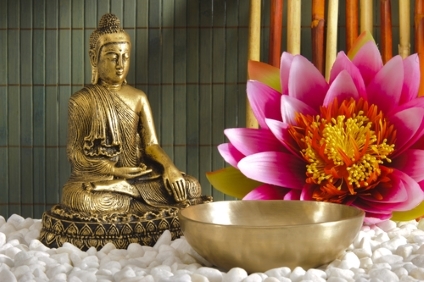 As you gain some experience, gradually increase the duration of your meditation sessions. For best result, we recommend 45 minutes to an hour. If you would like help getting started with your mindfulness meditation practice, check out the Quick Start to Mindfulness Meditation CD. This CD explains the basic meditation techniques using clear and simple language. It then shows you exactly how to implement them through the guided meditations. If you follow these techniques, you’ll soon be well on your way to realizing true happiness and inner peace. For a comprehensive discussion ot the 12 Steps of the Mindfulness Meditation Practice, we recommend our book, Mindfulness Meditation Made Simple: Your Guide to Finding True Inner Peace. It includes a series of exercises that will give you a solid foundation of the practice, so you can transform your life and relationships.